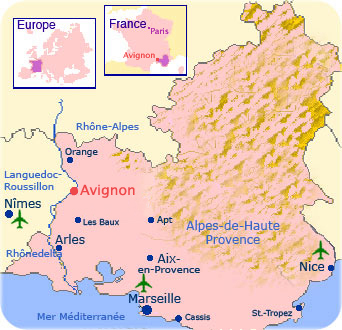 Avignon is located in Southern France, in the Provence region, about 700 km south of Paris and 100 km north of Marseille. The inner ancient town enclosed within city walls ("intra-muros", as opposed to the outer suburbs: "extra-muros") is about 2km in diameter and easily walkable. The Place de l'Horloge is its lively centre. The Popes moved to Avignon in 1309, and the town has been their residence during most of the 14th century, instead of Rome. It remained papal property (and the seat of a few anti-popes during the 15th century) until the French Revolution. The town is famous mainly for its broken bridge on the river Rhone pont Saint Bénezet and the Palais des Papes, the palace that was built by the first Popes in an impressive gothic fortified style. The Palace is situated on Place du Palais, just north of the Place de l'Horloge and close to the upper edge of the inner city. It is now a museum (and a conference centre, see below). Avignon boasts also a number of very good museums: with an extra day, the Musée du Petit Palais (italian and french Renaissance paintings), the Musée Calvet (fine arts and archeology) and the Musée Angladon (impressionism and cubism) are well worth a visit. The Tourism Information Centre has detailed information about the town. Here you find a map of the inner city. 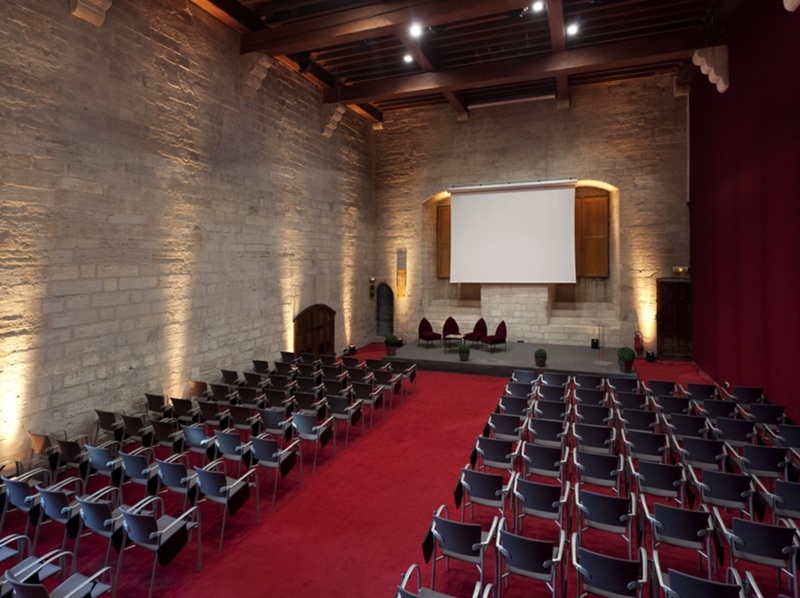 The Palais des Papes is now in part a conference centre, and it is where our Conference took place. We met in the Chambre du Trésorier. From abroad, most likely you flew into the Charles-de-Gaulle airport, situated in the northern metropolitan area of Paris, or into the Orly airport, situated south of Paris, and then took a high-speed TGV train down to Avignon. From Europe, you might also have found convenient flights into Marseille or Nimes. BY TRAIN: Avignon has two train stations. The Avignon-TGV station (Quartier de Courtine, about 4km out of town) serves most direct TGV trains from Paris; it is connected to the city centre by a short local train ride (4 or 5min, every 15-30min). The Avignon-Centre station (Bvd Saint-Roch, just outside the city walls to the south) serves mainly local lines and some TGV trains. Here is the french railway company website: SNCF. From Paris: Most TGV trains leave from Paris-Gare-de-Lyon and reach Avignon-TGV in around 2.5 hours: this is the most frequent connection. Some TGV trains reach Avignon-Centre in 3.5 hours. In Paris, you can go from the Charles-de-Gaulle and Orly airports to Gare-de-Lyon in about 1 hour via the suburban subway lines RER B and then A (here is the website of Paris subway system). Note that the Charles-de-Gaulle airport has a TGV train station itself: there are some direct and connecting trains to Avignon-TGV and this could be the most convenient option if it fits your schedule (about 3 hours, type Roissy or Aeroport CDG 2 TGV as departing station in the SNCF form). From Geneva: About 3 hours to Avignon-TGV, more if connecting in Lyon. From Lyon Part-Dieu station: About 1 hour to Avignon-TGV. From Marseille St-Charles station: About 30min to Avignon-TGV. From Nimes: About 20min to Avignon-TGV or 30min to Avignon-Centre. BY AIR: Avignon has a small airport (Avignon Châteaublanc, AVN) with a few connections to southern England. More airlines (including low-cost ones) serve the Marseille-Marignane airport (MRS), about 70km from Avignon; you can then complete the trip to Avignon by train from the airport station (called Vitrolles-Aéroport Marseille-Provence) or via downtown Marseille (St-Charles station). The airport of Nimes (FNI) has a few low-cost connections; you will have to complete the trip to Avignon in about 1 hour by shuttle bus to Nimes station and then by train. The Lyon Saint-Exupéry airport (LYS) is about 230km away; you will need to complete the trip by train. BY CAR: Avignon is at the cross road of motorways A7 (Paris-Marseille) and A9 (Provence-Spain). Some driving distances are: 700km to Paris, 390km to Geneva, 230km to Lyon, 300km to Italy, 270km to Spain. 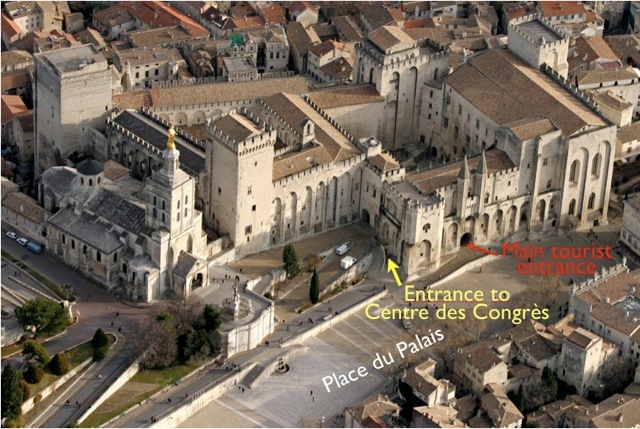 If you have a car, you can use the underground parking lot at the Palais des Papes. The participation at the Meeting may entitle you to a discount on the full price (which is 10.80 euros per day): please inform us in advance if you intend to use it.